A sports injury can happen in the blink of an eye – and could end an athlete’s career if it’s bad enough. That’s why, if you’re active or even considering a particularly ambitious activity, it’s important to know the injuries that are most likely to occur and what you can do to prevent them. You don’t have to consider yourself an athlete to be affected by a traditional sports injury. People who are active, work out regularly, and keep their bodies moving can just as easily be injured as someone who lives a more sedentary lifestyle – especially if you decide to take up an activity you might not normally do. Tennis, jogging, or even jumping rope all carry a risk of injury, so you should be clear on what to look for and how you can prevent a painful accident. An ankle sprain can result when the ankle turns in too far or you roll it. The sprain itself results when the ligaments that are holding your bones and muscles together are overextended. They can even be torn. In this case, you’d be left with a swollen, painful ankle that would hurt to put weight on. The best way to prevent an ankle sprain is to always stretch properly before athletic activities or even before taking a long walk. Special exercises to strengthen the muscles around your ankle can also help with stability to prevent future sprains. A groin pull, or a strain, can occur with a sudden movement that may pull any of the adductor muscles along your inner thigh. While this injury is most common in athletes who run, kick, or make sudden running movements, this can also affect anyone lifting heavy objects or who suffers a fall. 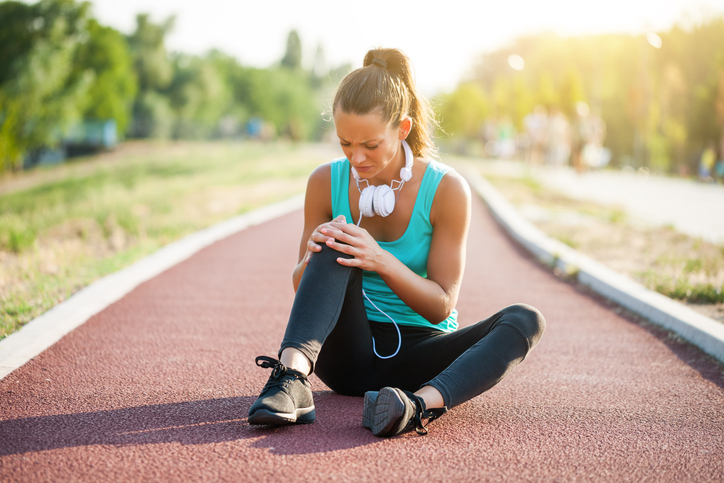 The best way to prevent this type of injury is to be cautious when using your adductor muscles and when you do, make sure your muscles are warmed up first. A shin splint is the most common term for microtears that may occur along your shin bone. While this is a common soccer or dancer injury, it can affect regular, nonathletes, too. If you have flat feet or weak ankles, you would feel this familiar throbbing in your shin when running or walking too fast as your body tries to overcompensate for these issues in other parts of your body. Stretching your calves and Achilles tendon is key to keeping your shins ache-free. The tearing of the anterior cruciate ligament (ACL) can not only significantly affect an athlete, it can affect anyone, depending on the injury. Your ACL may tear with a sudden movement that causes the ligament to contract suddenly before the movement. An ACL tear commonly affects football and soccer players who do a lot of agility running in all directions, but people can tear an ACL by sudden movements on trampolines or jumping rope, too. It’s very difficult to prevent an ACL injury other than strengthening your leg muscles. In reality though, avoid sudden movements with your legs to help lessen your risk. This issue can affect anyone who overexerts their arm but, of course, it most commonly affects tennis players. Due to overuse, overexertion, or overstretching, the condition can cause pain and make playing tennis or using your arms difficult. The best tips for prevention include wearing a brace for exercises for extra stability, avoiding the same repetitive movements, and above all strengthening your arm muscles around your elbow. If you suspect you are suffering from one of these injuries, or you just want information on preventing these common sports-related injuries, speak to the experts at Orthopedic Associates of West Jersey. Offering an array of both surgical and nonsurgical treatments, we aim to provide tailored care to your orthopedic needs. Call us today to schedule your consultation at (973) 989-0888.